Due to several emails I have received, I am considering slightly changing the format of the daily posts and wanted to get the reader's opinion on it. I have been asked if I would be willing to make multiple smaller daily posts, throughout trading hours. I would continue to cover much of the macro data still, while at the same time giving some real-time updates of portfolio trades and intraday news. If you could leave a comment on your thoughts of the plan, that would be great. Thanks. Today we saw yet another green day of trading today, with not much "good news" to support it. The market continues to be a day-trader's market, as bears are scared of continuing manipulation, and even most bulls think we've got to be having a pullback soon. As a result, we are continuing to see very low volume in the market. Commodities and energy bounced back today as continuing dollar concerns remain. During times of uncertainty, many find commodities and precious metals as a safe haven to park a lot of their cash. It is no surprise to see strong gains in these sectors and it's something I talked about as an opportunity in March. My concern is for the still strong possibility of deflation, at which point commodities would most likely take a hit. We know inflation is coming, but probably not until well into 2010 and 2011. There is a pretty big lag time for inflation to react to funds being flushed into the economy. Despite much of the optimism we have seen in certain sectors of the market, retail sales are still showing no signs recovery. We saw many of the retailers this past week report worse than expected numbers, which surprised many, especially after considering the rather large jump we received in consumer confidence numbers. Like I've said before, certain economic indicators experience much more variance than others, which makes it hard to use as a benchmark. Retail sales, unemployment, and average home sales are great benchmark indicators, as they usually point directly to discretionary income. One thing worth noting, is the movements of The Conference Board's Index of Leading Indicators (LEI) chart (see below). 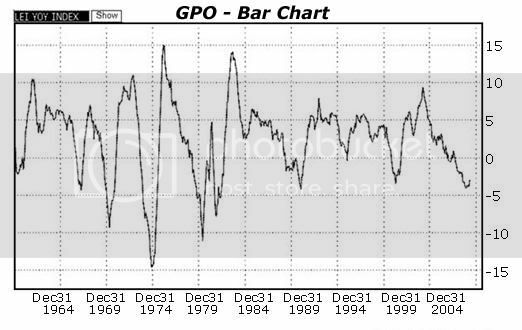 The chart is a macroeconomic analysis tool that has been very successful at predicting recessions, as well as predicting ends of recessions. Since 1960 it has predicted every recession, so it does possess some value to it. What I want you to see is how frequently we see a minor up tick in the graph, only to be followed by a stronger fall. However, on the way up, it usually possesses a direct path, with almost no backtrack. You will notice the slight curl that we are experiencing currently. If we are coming out of the recession, we would expect massive positive growth that would push this chart to new levels. Such results are very unlikely, especially when you consider the most recent data we have received. So once again, I say be careful when going long at this point. We will see how the market reacts to our new unemployment numbers released tomorrow. Once again, analysts have low balled the expected number, so even an "in line with expectations" number announced would be devastating news for our economy. At the current pace of jobless numbers we are seeing, if continued, will have continuing negative repercussions on the economy. 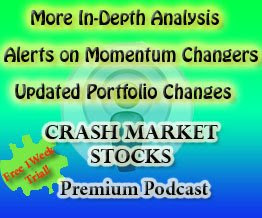 I am still sure markets are shifting and momentum will soon change (for good analysis, try IBD: Subscribe to Investor's Business Daily, the complete investing system, for only $1.17 per issue.) At this point, I am seeing a lot of great opportunities to buy on the short side, as many are at record lows. Happy Trading. Multiple smaller daily posts during the trading hours is a fantastic idea! Agreed. Multiple small intraday posts would be good. I'd like to know what's on FF's mind during trading hours. Especially following the release of key economic data like tomorrow's unemployment numbers. I like one posting in the evening. During the daytime I'm busy to follow the market. What would you write about during trading hours? what shorts are you considering? Of late the usual suspects like SRS and FAZ do not move much on down days and get demolished when the market is up. Would you be short the XRT and oil at this point? I think we continue to rally past 1000 on the S&P and perhaps till 1100 .... well above the 200 day moving average ....thats when everyone would be sucked in and feeling good about things. You still have to be careful going short here ....there is nothing much on the horizon till the next earnings season to change the course of this market. Especially when every economic data is being passed off as "better than expected". Watch for a "much better than expected" employment numbers and the longs continue to reign. i would enjoy multiple daily posts as i come to this site frequently throughout the day anyways to see if youre chatting on chat piece. Multiple posts would be appreciated but I really think you need to post Friday or Saturday as well for the weekend crowd. Also being in the chat for longer than 5minutes to discuss more trading idea's or patterns you see. I find the once/day posts the best approach. I would love to see thoughts during the weekend. 1 a day i like and also some weekend notes would be great. I like the longer daily posts. I'll make sure to get in some weekend posts, I usually do a podcast update during the weekend as well. We'll try the shorter daily posts, bc I believe by the end of the day, they will be just as informative as my longer 1 per day post would be, as always I appreciate feedback.